Cozie Blog » Blog Archive » What A Week! by coie - March 12th, 2007. These past few days have been great. We have been blessed over and over again with wonderful things. On Friday after mom and dad worked in the garden, I got dad’s laptop to download his emails for him. As he went through them and we discussed the grocery list for me to get I spotted an email from his "goat group" that said "Free Great Pyr L—- County, KY". I pointed it out to him and he had me call the lady. We have wanted a Great Pyrenees for about 2 years now. 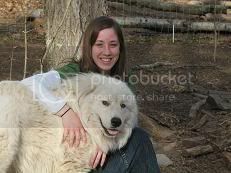 But not just any pyr….we wanted him to be about two years old, good with animals, and good with people. However, we never could afford one. When I called the lady (Mrs. Baldridge) she informed me that "Bandit" had been abandoned after the owners were arrested for drug use. When the Baldridges got him about 6 weeks ago he was so starved that the vet wouldn’t give him shots because there was nothing there, and he didn’t pass anything for 2 days. She told me that he was about 2 years old, had a great personality and never had any problems with their many animals. They were only getting rid of him because their other Pyr kept whoopin’ him. 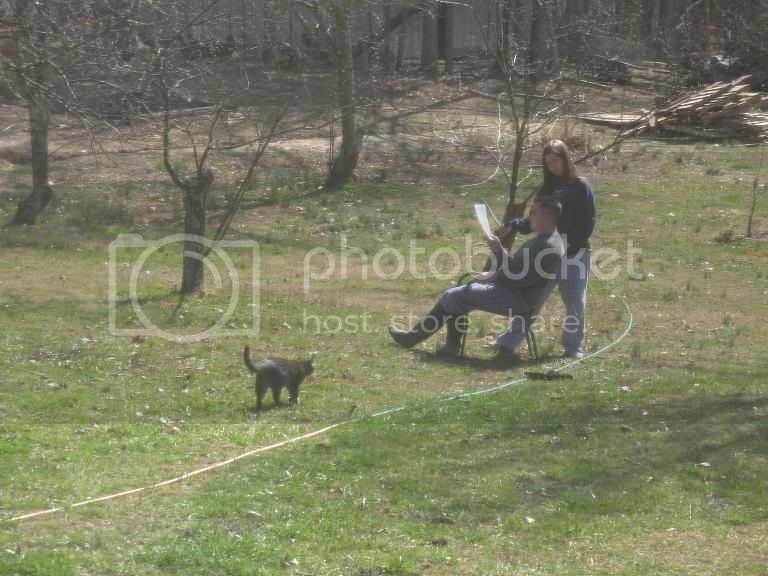 So we drove 4 hours up to Kentucky to get a dog that we had only heard about through a complete stranger. It was a lovely drive, and we read Ishmael aloud on the way up. When we arrived at the Baldridges it was about 6 o’clock, but we stayed till 7:30 looking at their animals and talking. They had one of the countries smallest horses (It’s back came to my knees) and one of the countries largest mules (it’s back went up 6 FEET!!!! I was astonished at seeing such a large animal!). At 7:30 we loaded Bandit into our van and started the drive home. He decided that he liked the back seat better and drooled all over my siblings heads the entire way home. This dog is the most lovable, happiest, gentlest dog I’ve ever seen. We didn’t like the name Bandit, but wanted his new name to sound similar, so he is now referred to as "Banjo". Just think…When we started thinking about getting a Pyr two years ago…and wanted one that was two years old….that’s when God created Banjo…..
On Saturday I got to unload half a trailer’s load of manure. Maybe I’m just weird, but I think shoveling manure compost stuff is fun and relaxing. I also raked out the goat pen which is fun….it is almost like doing those little sand meditative gardens where you place rocks hither and thither and make designs. Then we went to the Burggraf’s and then we picked up more manure for me to shovel. Yippee! 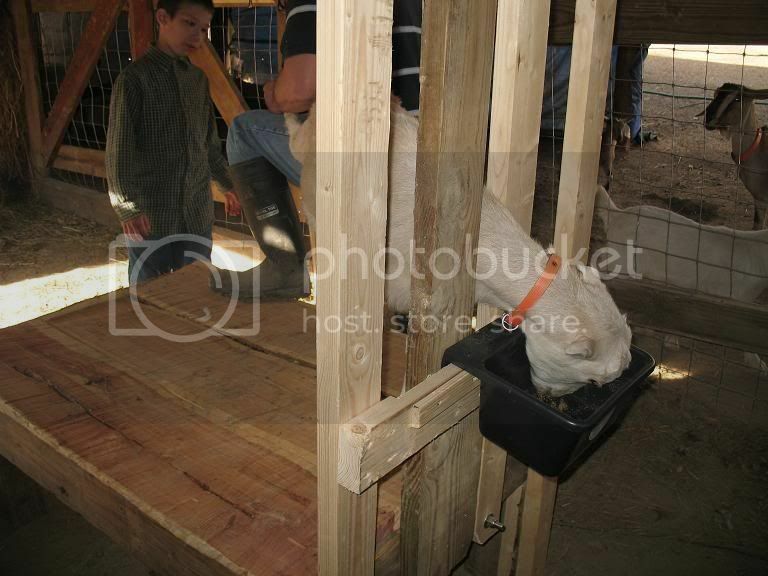 When we got home dad and I finished building the milkstand for the goats. It is ginormous, and it’s so cute. My dad cut down a cedar tree and made some lovely but albeit uneven boards for the floor of the stand. We also tacked on half of a cedar round on the back of it for decoration. It’s so rustic looking and I love it. Daisy is very laid back and is A-OK with anything, especially if food is in her presence. Yes, that is milk (just clarifying for you city folks). On Sunday we visited a church that we went to when we first moved out here. It took us about an hour and 15 minutes to get there, but the sermon was wonderful. It was about worshiping God and the importance of worshiping with fellow believers. A great line that the pastor stated was, "God’s word shows us what true worship is. What place do we have tailoring our worship to the whims and entertainment of unbelievers?" He went on to say that yes, it is wonderful when unbelievers come to church; it is then that they get a glimpse of our God, and of the fellowship of believers WORSHIPING together. An unbeliever CANNOT worship our God, and it is a waste to try and entertain these unbelievers. It is not saving anybody! We stayed afterwards and had a great time talking to old friends and meeting new ones. When we got home we put up some chicken wire to keep the chickens out of the feeding hay, I shoveled more manure (Yippee! ), and we raised a lopsided tree about 10 feet. We also trimmed goat hooves and milked our goats. Belle had diahrrea again so I had to give her Kaopectate. AND UGH! She is a little whatever. I couldn’t get her mouth open and got some in her nose and then she SNEEZED IT OUT ALL OVER ME! I fairly squeeled, yelled, and whined all at the same time. It was nasty. And today, I cut my dad’s and Bobo’s hair, did some TOS work and then went to the thrift store with mom and Peachy-Keen. I am so thankful for our "farm", my family, the beautiful weather that has allowed us to work so much outside, the time that I have had to sew and quilt, and the fellowship of believers. 12 Responses to What A Week! Coie, I'm tired, and don't feel up to leaving the long comment that is on my head, but please accept this as one of the greatest compliments I could give: I hope my kids (well, my daughters at least) grow up to be just like you. I think I like that pastor too! We have lots of "entertainment" around here…too many megachurches and too much money wasted on "things". You can see where their priorities are…sure they bring em in, but they don't grow em once they get there! Okay, let me get this straight. Yippee on shoveling mountains of manure but ewww to sneezed up Kaopectate??? Am I the only one that thinks that's a little backwards? Great job on the quilt! I really like the bold colors you chose…much more interesting than the usual pastels. 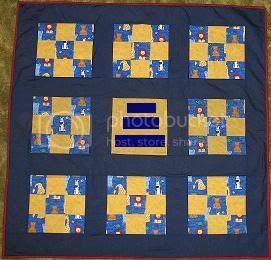 I've only sewn two baby quilts ever. One for my nephew and one for my niece. I'm too lazy/busy/whatever to actually sew one for my OWN children. You and your momsie sure to paint a fun picture of farm family life. Thanks for letting me take a peek at it! Your quilt is beautiful. And I was WAY across the room when I thought it looked like a plate of sushi. How blessed that baby is to have such a special friend and such a special gift. i'm just not sure what i am going to do if you ever get married and leave. you cannot begin to imagine how much i treasure you. We will drop all her siblings off at her new house and go on a vacation. Coie, could you please hurry up and find yourself a man? You have such a cute polar bear dog!! This is Mrs. Johnston. :) What great pictures and what fun you've been having!! :) You have such a great perspective on work/fun on your farm! What a blessing you are to your family! Your quilt is beautiful! We used to have a Great Pyrennes. I am glad that your's is sooo sweet and gentle. I hope you figure out the goat issues! Yeah! That button kept me busy for quite a while! You like it? I got them up yesterday (I thought it was time to get new pics up)! Joe thought the bagel was funny too! Take a look under my links in my side bar and you’ll see me link to his blog (it’s kinda funny)! Levi took all the pictures and the only way he was able to get a good angle was through the reflection! LOL! That’s funny that you noticed my shirt (I was trying to give that exact idea)!!! Anyhow, I was curious on what you meant about a button and not an ad?!?!? If you can’t make an ad, Joe will do it for half off (original price for an ad is $20. But if he gets a customer through me he’ll do it for $10)!!! Wow, pictures and Bulls Gap!!! I can't believe you know about…and actually go to Bulls Gap!!!!!!!!! That's crazy!!!! I have ALWAYS wanted to go there as a child.. and even now. I have forever been intrigued that a town (i guess it's big enough to be called a town) was named after my Great-Great Grandfather. My first daughter, Emery, who is 10, is named after my Great-Grandmother Stella Emery, who is John Bull's daughter. Family lore has it that he was a store owner and one of the first settlers in the area. I have also read a story that he was a famous gunsmith. I found that to be very interesting. My husband, Richard, is coming to Henry Burgraff's (i think that's how you spell it?) in April for the Men's Retreat. He's going up a day early to help set up. Is Bull's Gap close enough to Henry's so he could "check it out" for me? The pictures are fabulous!!!! My son, Richard, who is 5, (yep, we have two Richard's) particularly loved the one of the little boy with the squished up face drinking punch. I believe it is one of your brother's? My youngest daughter, Martha Bryan, who is 3, just kept asking…"Mommy are they at church" over and over and over and over again. She's persistant. Well, I guess that's it. You and your family have a grand day!!!!! It's cloudy here in Enoree, but a gorgeous day none the less.